UPDATE: In an effort to streamline the look and get some of the clutter out of my sidebars, I'm sticking all my fun little award badges in one widget. You can click on it any time to see what I've been up to lately, if you like! And if you want news from the latest Stampin' Up incentive trip or national convention, I have a category just for that, too. Thanks for YOUR part in making Song of My Heart what it has become over the course of a few years! I love what I do--and YOU are the very best part of all that I love about Stampin' Up and papercrafting. 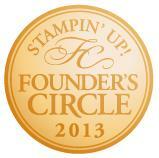 My first Founder's Circle was earned during the 2010-2011 Stampin' Up year. Founder's Circle is a private retreat in gorgeous St. George in southern Utah, gifted to the top 100 Demonstrators in the United States. I was so sure they had made a mistake when I got this award! Couldn't believe I had made it to the top 100 (I was #83!) just five years after joining the company. 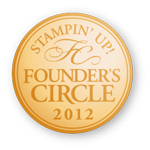 Lightning struck twice when I earned Founder's Circle a second time! Since the criteria are different every year depending on what everyone else is doing, all you can do is work your hardest and hope for the best. I was so blessed to be able to spend five relaxing days once again, with the best and brightest Stampin' Up demonstrators in the country. It's a three-peat! Here we are at Founder's Circle once again--and did I mention that each Founder's Circle recipient also gets a fabulous purse on Awards Night at convention, as well as a charm for our Pandora bracelets as a pillow gift during the retreat? I'm so spoiled! And so thankful for this honor, capping off what was a pretty difficult year health-wise. Now this is just crazy! I had my best year ever, but everyone was so on fire this year I thought for sure I'd lose my spot in the Top 100 Demonstrators of the Year. Feeling incredibly blessed that the Lord has allowed me to continue doing what I love as I help meet my family's needs and stay open to His leading me to use my talents for the ministry. Somebody pinch me! For the fifth year in a row, somehow I made it into the Top 100 Demonstrators once again. I think I was more humbled by this one than I ever have been before. Just a real awareness that I have been placed where I am by God's graciousness, and "for such a time as this." Founder's Circle had an extra bittersweet tang to it that year, as the program was discontinued. So thankful I had the opportunity to go to the very last one! (2009) The Big Island of Hawaii is a magical place, and I got to experience that with my favorite husband, thanks to Stampin' Up. We just walked around in a daze the first few days because it just didn't ever really sink in that we were in this fabulous place. It still seems like a dream... a dream come true! (2010) Mike couldn't go on this one due to conflicts with his school schedule, so I took my momma along! We had a wonderful week relaxing, getting spa treatments, eating way too much yummy cruise food, and soaking up the scenery in St. Lucia, St. Croix, St, John, Barbados and Antigua. (2011) I'm so glad Mike didn't miss this one! Later in the year due to the cruising season up north, we went on our first cruise together to the incredibly wild and gorgeous land of Alaska. Glaciers, sled dogs, gold mining, White Pass Railway, the Yukon--one adventure after another, all courtesy of Stampin' Up. It was truly the trip of a lifetime. (2012) The kids got to go on this one! Stampin' Up flew us in and put us up at the wonderful Boardwalk hotel right on the resort at Disney' World in Orlando Florida. My mom came along to help out since Mike could not come, and we all scrambled to keep up our whirlwind tour of Magic Kingdom, Animal Kingdom, Epcot and Disney's Hollywood Studios (my favorite). We were exhausted from all that fun--and determined to take Daddy back with us the next time. We were able to use Stampin' Up bonus money to come back as a family in May 2013 (and snuck in a visit to Legoland Florida as well). (2013) Who in the world gets to go to FIJI??!!! I DID!! Mike and I will never, ever, EVER forget the enchanting land of Fiji, the incredible beauty and restfulness, the sweet welcoming spirit of the people there. Our visit will remain one of the brightest spots in a life brimming with blessings... something I will remember as long as I live. (2014) My sister in law was my partner in crime on this fabulous Western Carribbean cruise to Haiti, Jamaica, and Cozumel in the spring of 2014. We partied hearty all week long! We were supposed to be relaxing but there wasn't time between the rock wall, the zip line, the ice shows and all the other truly astounding features of the world's largest cruise ship, Royal Caribbean's Allure of the Seas. No calories were counted on that trip, let me tell you! (2015) It's just too much--not only did Stampin' Up take me to Hawaii with my husband in 2009, they took me there again in 2015 with my good friend Kristin We explored Oahu, child-free, for five days and had the time of our lives (remind me to tell you about the red convertible day, sometime!) I still can't quite believe this jet-setting lifestyle is mine... Mike and I just hang onto our hats for the amazing ride that has been my Stampin' Up journey. (2016) In 2015 I earned the free trip for two for a Mediterranean Cruise, with stops in Barcelona, Cannes, Marseilles, Florence/Pisa, Naples/Amalfi Coast, and Rome!! Can you imagine? And this time, my history-professor-hubby Mike got to go, too. We stayed an extra week on our own dime and really DID Italy, with two extra days each in Rome, Florence and Venice. A highlight for me was seeing Pompeii and Mount Vesuvius... talk about a dream come true. 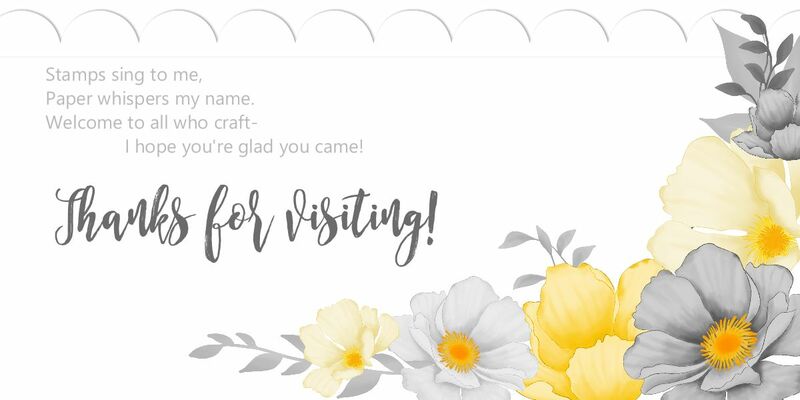 THANK YOU, Stampin' Up!! The 2018 trip was a week-long cruise up the Alaskan Inside Passage in July. We were very excited as my parents were coming along and paying for our kids to have a cabin as well. I am just blown away by God's goodness to allow them to have this experience of a lifetime and just at the perfect ages to appreciate it. It was their very first cruise and they LOVED it! The 2019 trip (number 11 for me!) has been earned! It is another cruise, this time departing from Rome and visiting the Greek Isles! I am so stoked to have earned this for my handsome history professor hubby. Only problem is, he may not want to come back to Wisconsin when we're done!